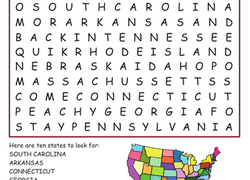 Search for and circle ten state names. Name as many other states as you can, then write down the number of states you named. 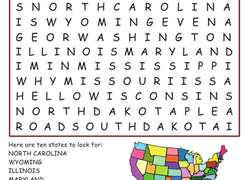 If you're getting ready to hit the road, be sure to pack this word search for the kids. 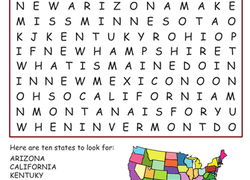 Search for and circle ten state names. How any more states can you name? Find and circle all ten state names in this geographical word search. Name as many other states as you can. Use words from street signs and billboards to create poetry. Pick four words, use one word per line in a four-line poem. Don't be afraid to get creative! 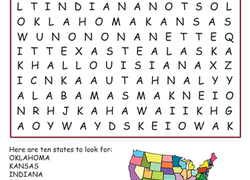 Search for and circle ten state names in this printable word search. Name as many other states as you can.